Shadow Uchiha concentrates his chackra as he prepares to do the tree climbing technique. Shadow Uchiha starts of at a jog and gradually builds speed he puts his foot on the tree and goes up about two feet before falling down. "Dammit I gotta get this technique, why do I have to have poor chackra control". Shadow Uchiha gets up and charges his chackra. He starts of at a run this time and goes up a couple more feet before falling again. "I wont stop until I get this". Shadow Uchiha once again gets up and charges his chackra. He starts of at a very fast rate this time and goes up about twenty feet marks the spot with his kunai and back flip off when he started to fall. A big smile came up on his face as he stared at the mark he left on the tree "Now thats more like". Shadow Uchiha lays down to rest and allow his chackra to be regained" Im burned out just gonna take a little nap" Shadow Uchiha starts to yawn and falls asleep in the forest. Shadow Uchiha wakes up a couple hours later to the sound of growling. He thought that it was his stomach then he looks around and realizes that it was the wolves in the forest and they were planning to make him their next meal. Quickly Shadow Uchiha draws a kunai as the wolves begin to surround him. Shadow Uchiha goes down in a low crouch and waits for the wolves to attack. One of the wolves pounces at Shadow Uchiha from behind and he sent the wolf flying with a kick that would make any ninjas heart sing. As the wolf hit the ground with a yelp all the other wolves took this as a cue to rush at Shadow Uchiha. He blocked their bites and doged their claws as they attacked then Shadow Uchiha said" What the hell am I doing with a kunai". Shadow Uchiha jumps into a nearby tree and puts the kunai back into his side pocket and reaches behind him to draw his katana from its sheath. "Dammit wheres my katana?" Shadow Uchiha then notices his katana laying on the ground where he left it. 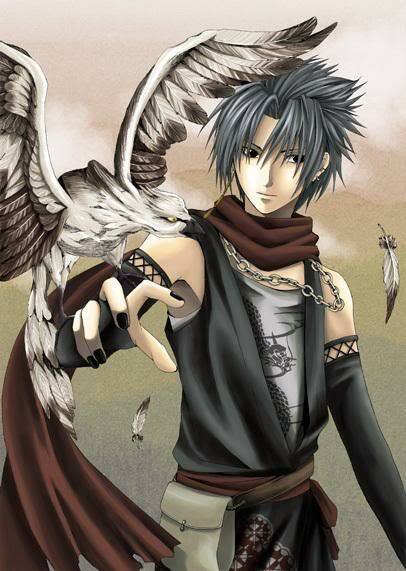 "Well might as well practice my ninjutsu" Shadow Uchiha jumps out of the tree and performs hand seals quickly"Shadow Shuriken Technique" Throws Fumma Shuriken at the wolves and takes out five of them. "Two left, I should be able to reach my katana before they get a bite out of me". Shadow Uchiha runs as fast as he can and makes a dive for his katana. He grabs the katana and unsheaths it while rolling to his feet. The two wolves circle Shadow Uchiha then pounces at the same time Shadow Uchiha slits the throat of one of the wolves but the other one hit with a full body tackle and once again his katana is out of reach." Damned wolves alright lets finish this. The wolf rushes at Shadow Uchiha he waits patiently when the wolf is about ten metres away Shadow Uchiha performs a perfect Leaf Whirlwind and breaks the wolf's neck. "Now wheres my katana" Shadow Uchiha picks up his katana and puts it back on his back. While leaving the forest he says" Now thats what you call a workout".